How to grow this tropical looking plant because it’s good for you in the Good Earth, some great tips on germinating seeds in Vegetable Heroes; a native fruit with caviar like insides in plant of the Week and a flower that signifies “ new beginnings” in Talking Flowers. Gardeners like to grow unusual herbs that are also useful. But you won’t be planting out seeds to start this next plant because you need rhizomes. Not only that, for this herb you won’t be using the leaves in cooking but the roots or rhizomes instead. There are a couple of different types of Turmeric available in Australia. One has bright orange flesh and the other is more yetlllow. Sourcing it all depends on if you have " Crop Swap" or Farmers' Markets in your district. 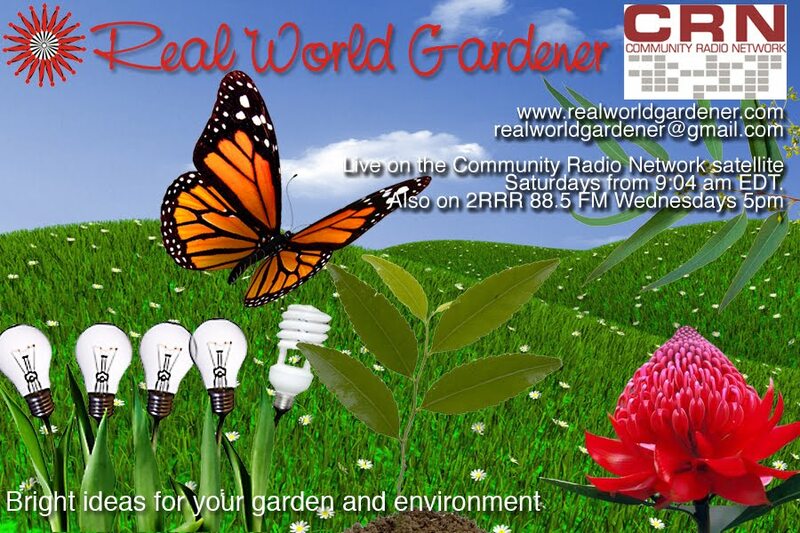 Once you have a fresh rhizome or root, all you need to do is plant it. A large root will have several branches or fingers to it. You can cut these apart and start more than one plant if you like. The easiest way to get it to sprout is to just bury the root under 5cms of potting mix. If there are any knobs or buds on the root, turn it so they are facing upwards. 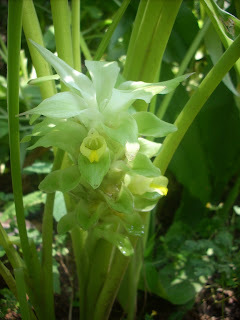 Turmeric grows downwards and spreads sideways, so don't plant it in a narrow pot. You can harvest the whole clump when the leaves have died , usually at the beginning of Winter of late Autumn depending on your district's climate. Growing from seed isn’t always easy and I know many a gardener from my days at Yates, that failed to germinate a whole bunch of different seeds. There's no need to be shocked if you seeds don't germinate. It happens to the best of gardeners so don't despair. Solutions to the problemThe answer to the seed raising question in a lot of cases was answered by saying that if seedlings get too wet or too dry, then they’re not going to germinate. So, are there any sure fire techniques that could work for you for some of those tricky seeds? Some gardeners and horticulturalists keep a record of everything they sow. Whether you are producing a few plants for your home flower and vegetable gardens or working at a larger-scale nursery, developing a propagation journal or notebook, is a good place to start if you’re having a hit and miss type of problem with your seeds. when seedlings are ready for transplanting each year. At the end of the year, evaluate the timing of when you put the seeds in, noting what went right and what went wrong. Next year you might then consider making adjustments so that you’re growing plants under optimum conditions. 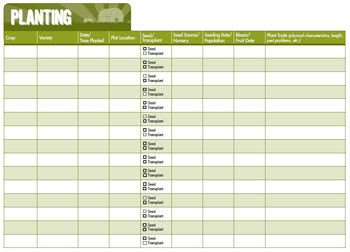 Also keep track of where you bought the seeds, as their quality and reliability might vary. Having said that, seed companies sell thousands of packets of each variety of seed and these have been batch tested for germination rates at above 85%. It’s pretty unlikely that a batch of seeds is unreliable without implying that several thousand other seeds won’t germinate either. The Next Thing is Where to Store Your Seeds. Store your seeds properly-not in a garden shed if it heats up during summer and is freezing cold in winter. The cold won’t matter so much as the heat. Seeds are a fragile commodity, and if not treated properly, their viability takes a dive. Did you know that some seeds can survive for thousands of years under the proper conditions, while others will lose viability quickly, even when properly stored? Parsnips is one that loses viability very quickly. The best way to store your precious seeds is to keep seeds in a cool, dark location with low humidity, like a cool laundry that won’t fluctuate in temperate that much. Some say put them in the fridge, but if you’re like me, you’d need a whole fridge just to keep the seeds in. Store the seeds in a plastic container, and label the top with the expiry date of the seeds. There is a test you can do for seed viability for many of your seed, although it’s not 100% bullet proof, and that is once you are ready to sow, you can soak them in water for a few hours. The seeds that are still living will sink to the bottom, while the dead ones will float on the surface. This test generally works better for larger seeds as a general rule. It’s worth a try in any case. The other method is to lay seeds on one half of a damp paper tower, and put them into a zip lock bag. Keep an eye on the moisture level of the paper towel, opening it when it looks dry and misting with water from a spray bottle. You seeds that are viable will germinate and these can be planted out into the garden, so nothing is wasted. When sowing seeds in punnets, especially if you’re re-using them, give the punnets a good soak with a 10% solution containing bleach so that any pathogens that might kill of the seeds is killed. This’ll take about 15 minutes. 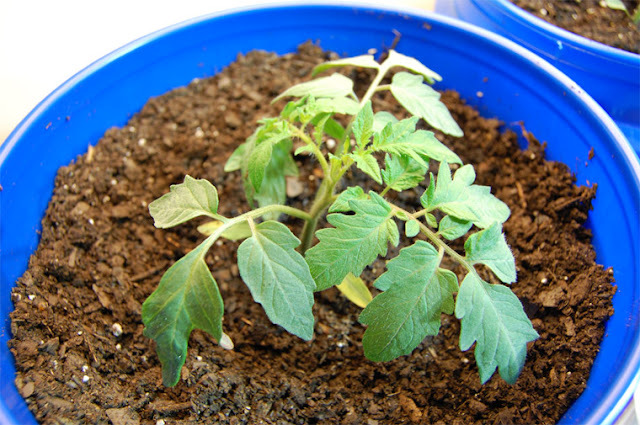 You’re better off sowing plants that resent root disturbance when transplanted into small, individual containers like cell packs or plug trays. Recycled plastic containers, like empty yogurt or margarine tubs, work well, too, as long as you've poked holes in the bottom for drainage. It doesn’t matter what type of container you use as long as it’s clean and free of pathogens. Another big factor in seeds not germinating is covering them with too much or too little seed raising mix. If you’ve got an old kitchen sieve, use that to sprinkle the mix over the seeds after you’ve sown them into the punnets or vegetable garden. Very fine seeds that need light to germinate should be barely covered if at all. In this case, I tend to light sprinkle some soaked vermiculite over the seeds, so they won’t dry out but are weighed down by the mix. Each seed must make good contact with the soil and the best way to do this isn’t with your fingers-the seeds might stick to them, but with a small piece of wood, or the bottom of a glass jar. Water in your seeds either from the bottom up, or with a spray bottle so the seeds aren’t dislodged. Then cover your seeds with a plastic bag, a cut off plastic drink bottle, or in a mini greenhouse. Don’t water again unless you that you need to rehydrate your seed container. The best way to do this is, place the entire punnet, pot or whatever you’re using in a basin with about 5-7 cm of luke-warm water and allow the planting medium to wick moisture from the bottom. If just the surface has dried, you can lift the plastic covering and spritz the surface with water from a spray bottle. As soon as the seeds germinate, remove the plastic covering.. 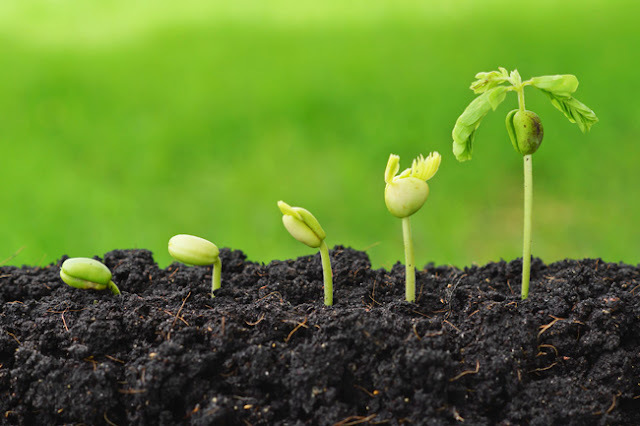 Most seeds like temperatures of around 18 ° to 25°C to germinate. If your put your seeds near a hot heater or use, a heating pad designed for germinating seeds, you’ll get a much fast germination rate in the cooler months. In this case be sure to check for moisture often, since the seed containers may dry out more quickly. Keep in mind that most seeds won’t germinate without sunlight. Once the seeds have germinated they’ll grow best if they have at least 8 hours of sunlight each day. For indoors, place seed trays in a sunny, north-facing window and give the tray or whatever a quarter turn each day to prevent the seedlings from overreaching toward the light and developing weak, elongated stems. Once your seedlings have grown at least 4 leaves, they’ll need some nutrients fairly regularly to keep your seedlings growing strong. When the embryo inside a seed is developing, it relies on food stored in the endosperm to fuel its growth. s the shoot emerges from the soil and the true leaves develop, the initial nutrients supplied by the endosperm will be depleted. Most seed-starting mixes contain a small amount of nutrients to help the initial seedling growth and not burn the developing roots. 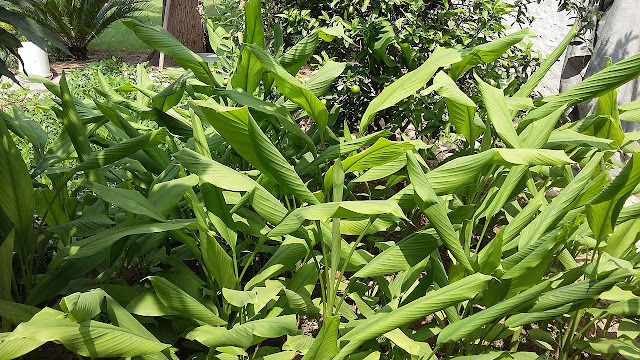 But, once the true leaves emerge, it’s time to begin a half-strength liquid fertilizer regimen on a weekly basis and to get the most out of your seedlings, start using some kind of seaweed solution to get strong root growth. The lemon tree is ubiquitous to most home gardens but are you aware that Australia has its own native citrus? The fruit from Australia’s citrus is so unique though that top chefs are using it as a garnish in their cuisine. Australian Native Citrus is still citrusy but not as we know it. The leaves are similar to Murraya Min a Min being much smaller and finer that the leaves of a regular citrus tree. The inner fruit consist of vesicles that aren’t joined as in the segments of say a Mandarin, making them pop out like the finest of Beluga caviars. The trees are thorny, as Karen says, they're not called nature's barbed wire for nothing. 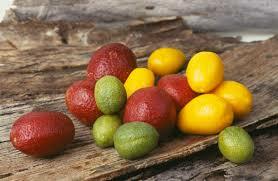 Australian native citrus produce finger shaped fruit up to 12 cm long with a typically green-yellow skin and pulp. These citrus trees tolerate light frost; grows best in light shade or sunny spot. Suits sub-tropical. Warm temperate, cool temperate and Mediterranean climates. Prune: Lightly, in spring. Don't prune too hard when fruit is forming as you can accidentally cut off your upcoming crop. Daffodils of all kinds for the vase. All Daffodils belong to the genus narcissus, which includes jonquils and paperwhites. 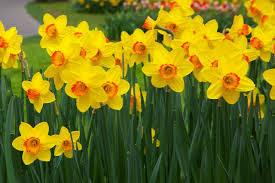 Some gardeners call yellow narcissus, daffodils and the smaller, paler versions as jonquils, but they all belong to the genus narcissus and technically all carry the common name of daffodil. The genus name comes from the Greek god narcissus. According to legend, Narcissus was so enamored with his own reflection in the river that he drowned trying to capture his reflection. The daffodils growing along stream banks in their native Mediterranean origin and all soon became associated with Narcissus and took on the Greek god's name.